The thing about religious titles is that people need them and use them for show. A distinctive ministry needs not to be public. 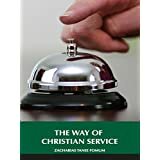 God does not need to tell people, “I have given this person this specific ministry.” Distinctive ministry can be a private ministry. Anna the prophetess was given the distinctive ministry of fasting and praying until the Hope of Israel was revealed. Simeon had the distinctive ministry of waiting on God until the Lord Jesus was brought to the temple; and when He was brought there, his distinctive ministry to the Lord and to the Lord’s people was accomplished, and he said, “Lord, lettest thou thy servant depart in peace,” because the ministry was fulfilled. He had done what God had called him to do almost unnoticed by anyone except God. A certain believer in the United States of America received a distinctive ministry from the Lord to pray every Friday night until Saturday morning all alone in a chapel for five years according to very specific instructions. She knew clearly that the Lord had called her to that ministry. From that day when she heard God’s voice and received that ministry, it became the one thing in her life. She spent the rest of the week preparing spiritually for that Friday night vigil with God. She judged everything by its impact on her fellowship with God and that weekly night of prayer. She went on in the loneliness of her ministry unknown to the advertising world of religious politicians and showmen. After five years, on a Friday night, she went to the chapel to pray as usual, but she could not pray. She was surprised, but then she remembered that the five years were over and so she thanked the Lord for enabling her to be faithful and then went back home. The next week the Holy Spirit came down in great might in that formerly cold and formal assembly, and many were filled with the Holy Spirit, and revival broke out and spread to many assemblies. That Sunday when the revival broke out one man was preaching. His name was carried on papers as a great revivalist! However, God knew who the revivalist was and on the day of reckoning she will be greatly rewarded, whereas that preacher may go unrewarded unless he, too, was a man who paid the price in his own walk with God. God may call someone or some people to the distinctive ministry of praying for some servant of God or for some ministry. I will never forget the impact of the life of Brother Nash on me. He was called by the Lord, not to preach, but to be the force behind the ministry of the famous revivalist Finney. He followed Finney wherever he went and, while Finney preached, he prayed. God did very great things through the ministry of Finney. Was it because he was very great? We acknowledge that he was consecrated. However, part of the answer to Finney’s unusual success was this private prayer giant who received from the Lord the distinctive ministry of following Finney all over and paying the price in prayer. Finney will be rewarded on that day, but I believe that Brother Nash will also receive a great reward, for, whereas Finney was seen by God and man, Nash was seen mainly by principalities and powers. Finney received all the praise and sometimes the insults from men. Nash received no praise from men. Finney was well known by men. Nash was known only to God. Both laboured " one in public and the other in private " but both laboured. Finney’s task was a little easier than Nash’s; for Finney sometimes had men as his enemies, whereas Nash constantly had principalities and powers as his enemies. Together as a team, they did a great work for God. They both finished their ministries with joy. We thank God for each one of them. My prayer is that the Lord should again call many to the private but distinctive ministries, especially those of prayer and waiting on God. These to me are the most needed ministries in the church today. The twenty-four elders never leave God’s presence. They wait on Him. Theirs is a most far-reaching ministry. Shall we find their equivalent in the Church on earth today? Will carnal activity give way to spiritual waiting on God? Lord, help us. About the private ministries where the minister is not seen and not fêted, I want to say that the glory about them is the fact that their very nature eliminates self-seeking men. They do not provide room for those who desire to glorify the flesh or who want to see immediate results. They are carried out by men who have died to the opinions and applauses of man, by men who are prepared to stand the scrutiny that goes with living in God’s immediate presence and leaving all reward to Him who sees in secret.